What a gorgeous 3 piece butter server. The backstamp on the bowl has a coat of arms in green with the initial P. on the left side of it and T. on the right side. Underneath that-in green-is "Bavaria, Tirschenreuth". In red is a crown over a large flourish and "The Dresden", 3815. This set was made by the Porcelain Factory Tirschenreuth, Tirschenreuth, Bavaria, Germany, probably in the 1950s-1960s. The bowl measures 7 1/2" in diameter. There is a round disc with a large hole surrounded by smaller holes to hold the butter above cold water or ice. It is 4 1/2" in diameter. The cover has an outstanding knob on top. There is a chip in the cover that you can see in the photo above the inner disc. It does not show when the lid is in place. Otherwise, there is no damage to the set. 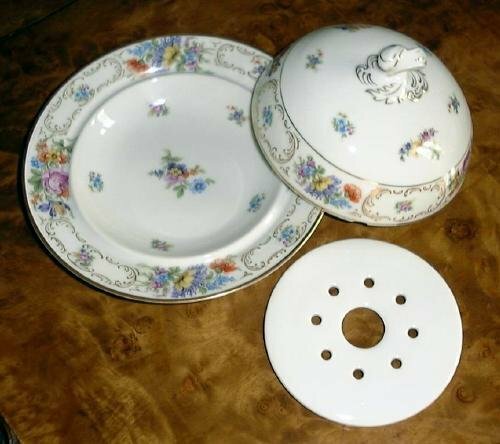 Please take time to see all the Dresden Flower china that I have listed. Email me with any questions you have about the china---asisk@bellsouth.net.